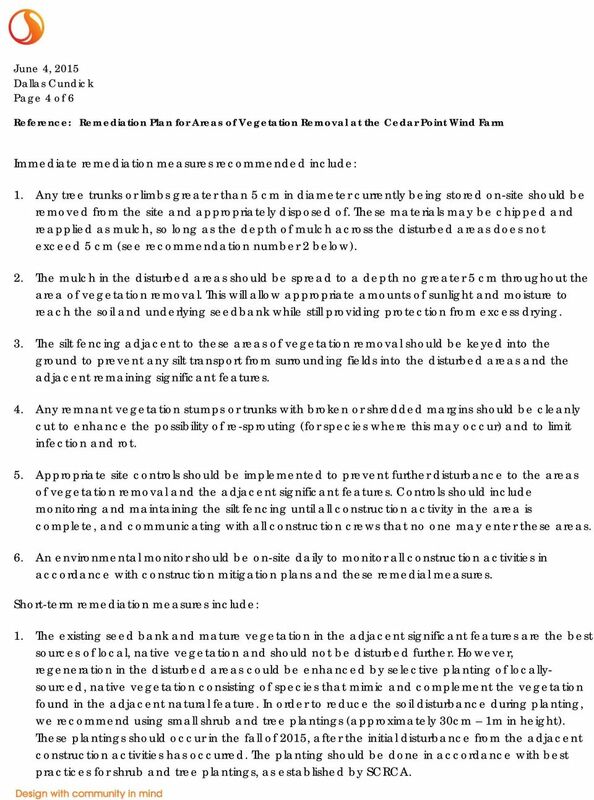 Download "Reference: Remediation Plan for Areas of Vegetation Removal at the Cedar Point Wind Farm"
1 Stantec Consulting Ltd. 1-7 Southgate Drive, Guelph ON N1G 4P5 June 4, 215 File: Attention: St. Clair Region Conservation Authority 25 Mill Pond Crescent, Strathroy, ON N7G 3P9 Dear, In early 215, a project-contracted arborist removed small exterior segments of vegetation in significant wetlands and woodlands during site preparation for the installation of the overhead transmission line in the Cedar Point Wind Farm please see Figure 1, attached). 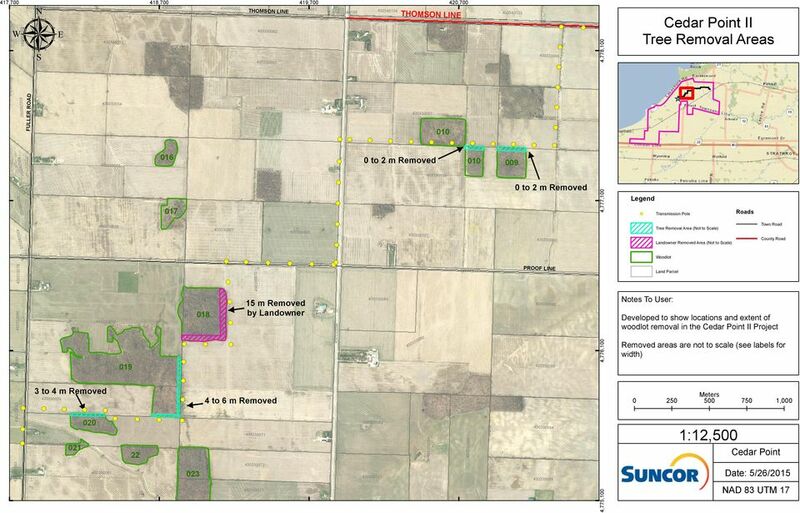 This vegetation removal was not permitted as part of Suncor s Renewable Energy Approval REA) or St. Clair Region Conservation Authority SCRCA) permits. On April 24, 215, the areas of vegetation removal were investigated by the SCRCA, and it was determined that approximately 3166 m 2 of area had been cleared. In response to your Violation of O.R. 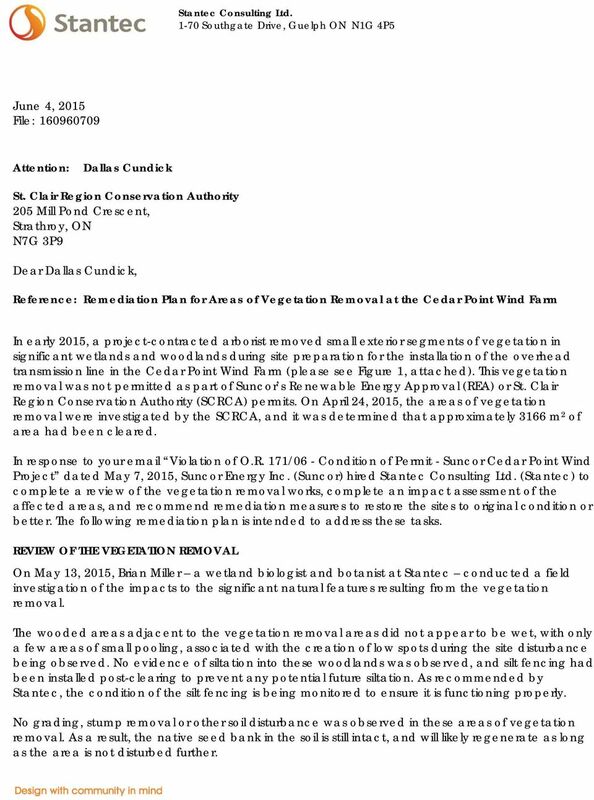 171/6 - Condition of Permit - Suncor Cedar Point Wind Project dated May 7, 215, Suncor Energy Inc. Suncor) hired Stantec Consulting Ltd. Stantec) to complete a review of the vegetation removal works, complete an impact assessment of the affected areas, and recommend remediation measures to restore the sites to original condition or better. The following remediation plan is intended to address these tasks. REVIEW OF THE VEGETATION REMOVAL On May 13, 215, Brian Miller a wetland biologist and botanist at Stantec conducted a field investigation of the impacts to the significant natural features resulting from the vegetation removal. The wooded areas adjacent to the vegetation removal areas did not appear to be wet, with only a few areas of small pooling, associated with the creation of low spots during the site disturbance being observed. No evidence of siltation into these woodlands was observed, and silt fencing had been installed post-clearing to prevent any potential future siltation. As recommended by Stantec, the condition of the silt fencing is being monitored to ensure it is functioning properly. No grading, stump removal or other soil disturbance was observed in these areas of vegetation removal. As a result, the native seed bank in the soil is still intact, and will likely regenerate as long as the area is not disturbed further. 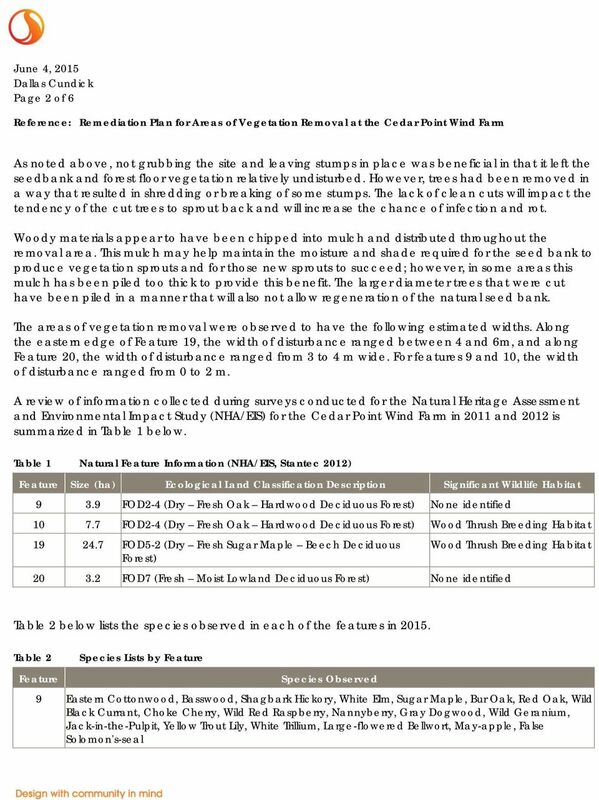 3 Page 3 of 6 Table 2 Feature Species Lists by Feature Species Observed 1 White Elm, Freeman's Swamp) Maple, Bitternut Hickory, Bur Oak, Basswood, lots of dead Ash, Silky Dogwood, Red-osier Dogwood, Choke Cherry, Riverbank Grape, immature Carex sedges 19 Sugar Maple, Ironwood Hop-hornbeam), Shagbark Hickory, Red Oak, Choke Cherry, Wild Black Currant, Prickly Gooseberry, Running Strawberry Bush, May-apple, Virginia Waterleaf, Carex gracillima, Wild Geranium, Cut-leaved Toothwort, White Trillium, Zig-zag Goldenrod, False Solomon's-seal, Wild Leek 2 Freeman's Swamp) Maple, Shagbark Hickory, Basswood, Eastern Cottonwood, Wild Black Currant, Choke Cherry IMPACT ASSESSMENT Based on the field visit, the hydrologic function of the woodlands and wetlands has not been adversely affected as there was no significant ground disturbance inside the natural features. The ecological function of the areas was reduced where vegetation that provided wildlife habitat was removed. 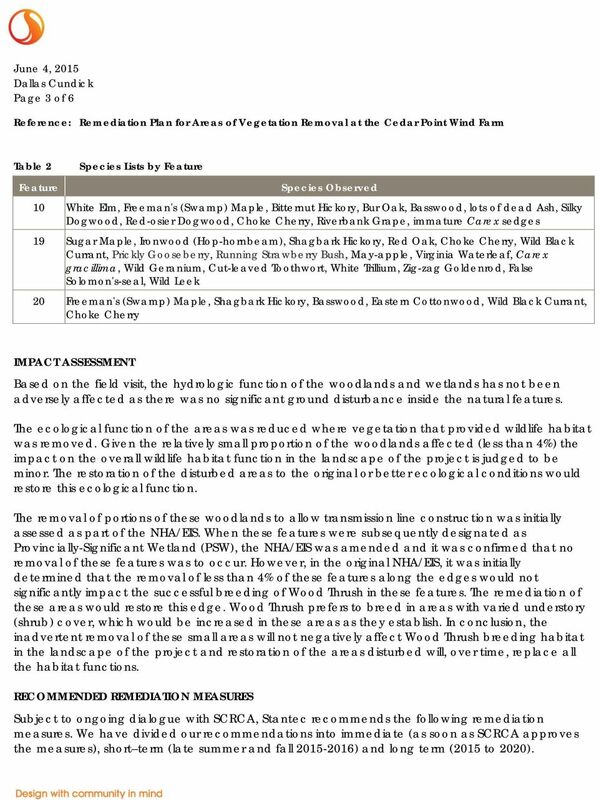 Given the relatively small proportion of the woodlands affected less than 4%) the impact on the overall wildlife habitat function in the landscape of the project is judged to be minor. The restoration of the disturbed areas to the original or better ecological conditions would restore this ecological function. The removal of portions of these woodlands to allow transmission line construction was initially assessed as part of the NHA/EIS. When these features were subsequently designated as Provincially-Significant Wetland PSW), the NHA/EIS was amended and it was confirmed that no removal of these features was to occur. However, in the original NHA/EIS, it was initially determined that the removal of less than 4% of these features along the edges would not significantly impact the successful breeding of Wood Thrush in these features. The remediation of these areas would restore this edge. Wood Thrush prefers to breed in areas with varied understory shrub) cover, which would be increased in these areas as they establish. In conclusion, the inadvertent removal of these small areas will not negatively affect Wood Thrush breeding habitat in the landscape of the project and restoration of the areas disturbed will, over time, replace all the habitat functions. 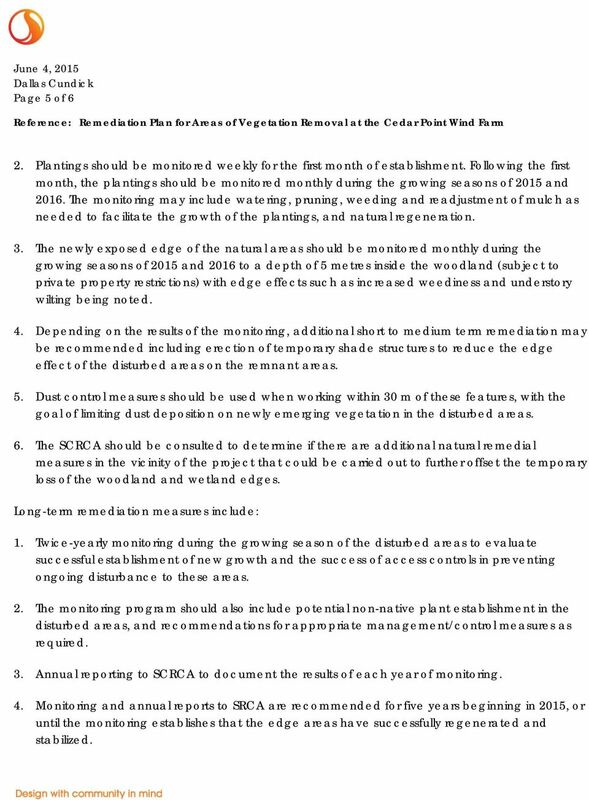 RECOMMENDED REMEDIATION MEASURES Subject to ongoing dialogue with SCRCA, Stantec recommends the following remediation measures. We have divided our recommendations into immediate as soon as SCRCA approves the measures), short term late summer and fall ) and long term 215 to 22). 4 Page 4 of 6 Immediate remediation measures recommended include: 1. Any tree trunks or limbs greater than 5 cm in diameter currently being stored on-site should be removed from the site and appropriately disposed of. These materials may be chipped and reapplied as mulch, so long as the depth of mulch across the disturbed areas does not exceed 5 cm see recommendation number 2 below). 2. The mulch in the disturbed areas should be spread to a depth no greater 5 cm throughout the area of vegetation removal. This will allow appropriate amounts of sunlight and moisture to reach the soil and underlying seedbank while still providing protection from excess drying. 3. The silt fencing adjacent to these areas of vegetation removal should be keyed into the ground to prevent any silt transport from surrounding fields into the disturbed areas and the adjacent remaining significant features. 4. Any remnant vegetation stumps or trunks with broken or shredded margins should be cleanly cut to enhance the possibility of re-sprouting for species where this may occur) and to limit infection and rot. 5. Appropriate site controls should be implemented to prevent further disturbance to the areas of vegetation removal and the adjacent significant features. Controls should include monitoring and maintaining the silt fencing until all construction activity in the area is complete, and communicating with all construction crews that no one may enter these areas. 6. An environmental monitor should be on-site daily to monitor all construction activities in accordance with construction mitigation plans and these remedial measures. Short-term remediation measures include: 1. The existing seed bank and mature vegetation in the adjacent significant features are the best sources of local, native vegetation and should not be disturbed further. However, regeneration in the disturbed areas could be enhanced by selective planting of locallysourced, native vegetation consisting of species that mimic and complement the vegetation found in the adjacent natural feature. In order to reduce the soil disturbance during planting, we recommend using small shrub and tree plantings approximately 3cm 1m in height). These plantings should occur in the fall of 215, after the initial disturbance from the adjacent construction activities has occurred. The planting should be done in accordance with best practices for shrub and tree plantings, as established by SCRCA. 5 Page 5 of 6 2. Plantings should be monitored weekly for the first month of establishment. Following the first month, the plantings should be monitored monthly during the growing seasons of 215 and 216. The monitoring may include watering, pruning, weeding and readjustment of mulch as needed to facilitate the growth of the plantings, and natural regeneration. 3. The newly exposed edge of the natural areas should be monitored monthly during the growing seasons of 215 and 216 to a depth of 5 metres inside the woodland subject to private property restrictions) with edge effects such as increased weediness and understory wilting being noted. 4. Depending on the results of the monitoring, additional short to medium term remediation may be recommended including erection of temporary shade structures to reduce the edge effect of the disturbed areas on the remnant areas. 5. Dust control measures should be used when working within 3 m of these features, with the goal of limiting dust deposition on newly emerging vegetation in the disturbed areas. 6. The SCRCA should be consulted to determine if there are additional natural remedial measures in the vicinity of the project that could be carried out to further offset the temporary loss of the woodland and wetland edges. Long-term remediation measures include: 1. Twice-yearly monitoring during the growing season of the disturbed areas to evaluate successful establishment of new growth and the success of access controls in preventing ongoing disturbance to these areas. 2. The monitoring program should also include potential non-native plant establishment in the disturbed areas, and recommendations for appropriate management/control measures as required. 3. Annual reporting to SCRCA to document the results of each year of monitoring. 4. Monitoring and annual reports to SRCA are recommended for five years beginning in 215, or until the monitoring establishes that the edge areas have successfully regenerated and stabilized. CHAPTER 807 LANDSCAPING AND SCREENING 807.001. Purpose 807.005. Definitions 807.010. Applicability 807.015. Landscaping and Screening 807.020. Landscaping Plan 807.025. Plant Material Standards 807.030. B. Improve the appearance and character of areas surrounding new development. Useful websites: RSPB Advice on planting a hedge http://www.rspb.org.uk/gardens/advice/gardenhedges/ planting_a_hedge.asp Forest of Dean District Council Landscape Character Assessment http://www.fdean.gov.uk/content.asp? WEEDS Introduction Weeds are any plants that grow where they are unwanted. Common weeds are fast growing, resilient nuisances that compete with your cultivated plants for nutrients, water, and sunlight. 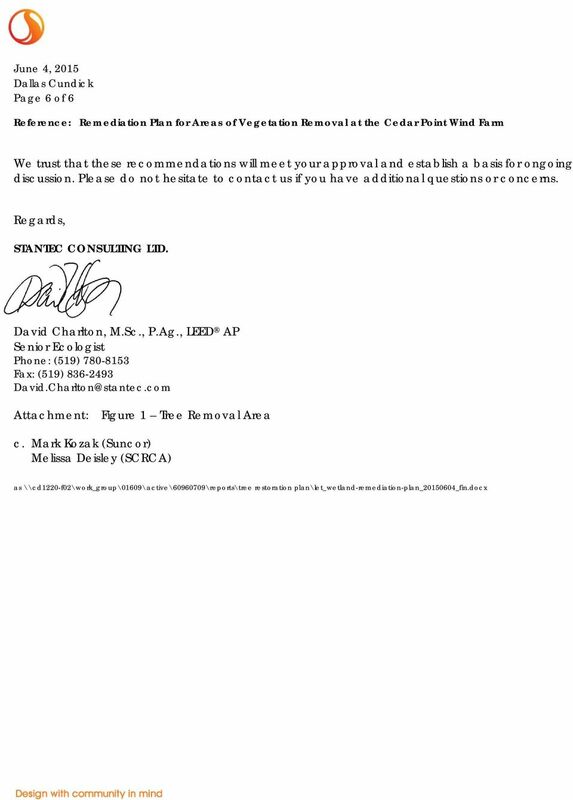 King Fire Restoration Project, Eldorado National Forest, Placer and El Dorado Counties, Notice of intent to prepare an environmental impact statement.